Beautifully engraved certificate from the Ely Central Copper Company issued in 1909 and 1910. This historic document was printed by the American Banknote Company and has an ornate border around it with a vignette of men working in a mine. This item is hand signed by the Company’s President ( O.A. Turner ) and Treasurer and is over 94 years old. Early miners prospected and found gold and silver deposits in what is now known as White Pine County in the 1860's and their placer mining efforts showed enough promise of riches to cause small "booms" in various locations for the next several years. Hamilton, Schellbourne, Black Horse, Ward, Taylor, Aurum, Osceola and many other towns would flourish for a time, then wither away to become empty or almost empty ghost towns. Each mining district and ghost town in White Pine County, Nevada has its own stories that can be found on the ghost town pages. Most claims have been worked sporadically over the years by men who could not give up the hope of "striking it rich." In 1908 the Giroux property and that of the Butte & Ely Co. passed into the control of the so-called Cole-Ryan interests, and several adjacent properties were purchased. In 1913 the Consolidated Copper Mines Co. was formed for the purpose of consolidating the Giroux Consolidated Mining co., the Coppermines Co., the Ely Central Co., and the Chainman Consolidated Copper Co. The company prepared to build a smelter at McGill that would have a capacity to process 10,000 tons of ore a day. 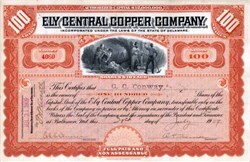 The Consolidated Copper Company led had a direct hand in bringing the Nevada Northern Railroad a distance of 150 miles (from Cobre to Ely) to transport the copper ore. On September 30, 1906, Mark Requa drove the copper spike made from copper ore from the Ruth Mine into the ground to celebrate the arrival of the train. Over the years, the Consolidated Copper Company developed the Richards, Alpha, Emma and Morris underground mines. In 1922 the company was reorganized in the Consolidated Copper Mines Corporation. The Tonopah Mining Company of Nevada was incorporated on July 12, 1901 in Wilmington, Delaware, for the purpose of developing and operating a gold and silver ores property at Tonopah, Nevada. The property was purchased from James L. Butler, the original discoverer of the Tonopah claims. 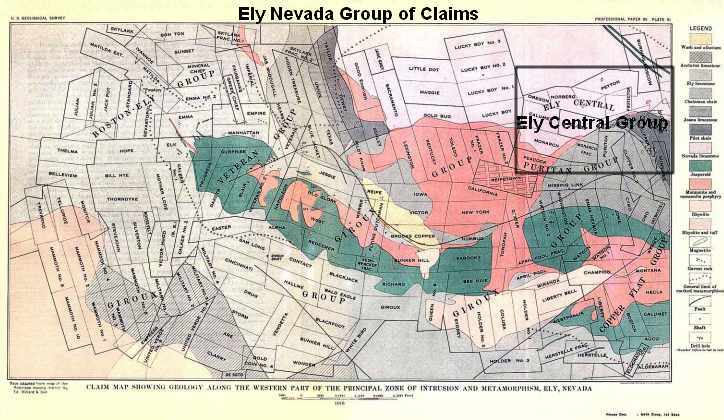 The company was formed by a group of Philadelphia businessmen including John Woodside, John Andersen, and Arthur Brock; they were represented by Oscar A. Turner, a mining promoter, who optioned the property in Tonopah, Nevada, for $336,000. The company's original stock issue was capitalized at $1,360,000; $360,000 was eight percent preferred stock and it was retired in January 1905. Tonopah's stock registrar was the Fourth Street National Bank (Philadelphia) until 1928 when it merged with Philadelphia National Bank which assumed the role. The U.S. Tungsten Corporation was incorporated in August 1910. O.A. Turner sold the corporation mining claims in exchange for one million shares at a value of one million dollars. The corporation conducted mining and had a mill located in Ely, White Pine County, Nevada, producing ferro tungsten and ferro chrome. The U.S. Tungsten Corporation was liquidated in 1917.